Approximately 6 miles of the Lakelands Trail State Park traverses Hamburg Township and is a major recreation pathway in the Township. 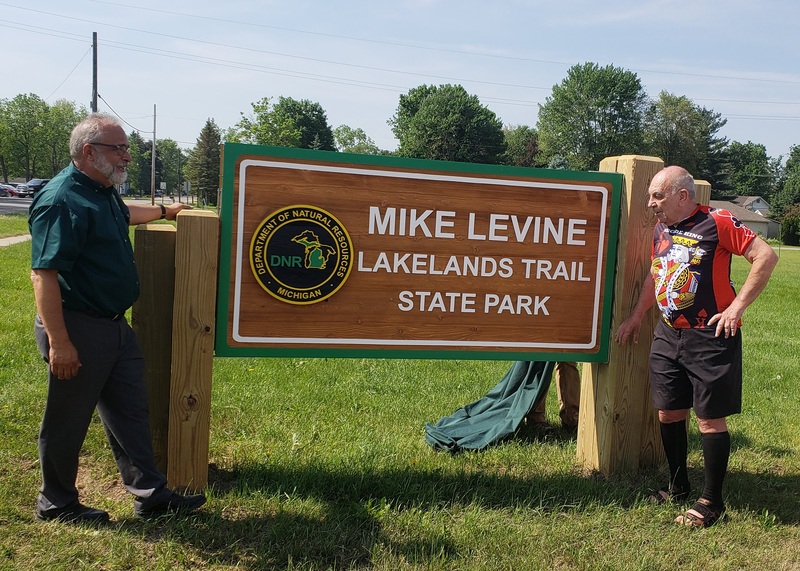 In recognition of a Michigan trails champion, the Michigan Department of Natural Resources has renamed the Lakelands Trail State Park – part of the Great Lake-to-Lake Trail that stretches from South Haven to Port Huron – as the Mike Levine Lakelands Trail State Park. Levine, an inventor and philanthropist from southeast Michigan, in September 2016 pledged $5 million for a variety of Michigan trail projects, including design, development and construction of the Lakelands Trail and the Great Lake-to-Lake Trail. The Mike Levine Lakelands Trail State Park starts at Hall Road in Livingston County and extends to Hawkins Road in Henrietta Township in Jackson County. More than 60 people gathered in Pinckney last week to help celebrate Levine’s contributions to Michigan’s trails. Speakers representing the DNR, the Department of Transportation and the Michigan History Center joined Bob Wilson, executive director of the Michigan Trails and Greenways Alliance, in discussing the history of the Lakelands Trail, its funding, and Levine’s efforts to support the trail. “Mike has pledged his time, his passion and millions of dollars to expand and improve trails throughout the state,” Wilson said. During the ceremony, a new Mike Levine Lakelands Trail State Park sign was unveiled and a new award in Levine’s name was announced. The award, to be presented annually by the Michigan Trails and Greenways Alliance, will honor an outstanding trails volunteer and be announced each September during Michigan Trails Week. “We are fortunate to have passionate trail supporters like Mike Levine who are willing to invest in Michigan’s trails system and leave a legacy,” said Ron Olson, DNR Parks and Recreation chief. Dan Spegel, Heritage Trail coordinator with the Michigan History Center, said the Lakelands Trail, built on an old rail line, opened for public use in 1994. Part of Levine’s $5 million pledge also will support development of trail connections to Michigan’s Iron Belle Trail, the state’s showcase trail that offers bicycling and hiking routes that run from Belle in Detroit all the way to Ironwood in the western Upper Peninsula. That trail currently is about 68 percent completed, with more development and construction efforts under way. Michigan offers more than 12,500 miles of state-designated trails and pathways, one of the largest, interconnected trail systems in the country. Those trails and the associated quality of life, health and economic benefits they offer, are cementing Michigan’s reputation as the nation’s “Trails State.” Michigan’s trails provide ample opportunities for bicyclists, hikers, ORV riders, cross-country skiers, snowmobilers, horseback riders and others. Learn more about the state’s trail offerings on the DNR website michigan.gov/dnrtrails. Want to schedule an event on the Lakelands Trail? Contact the Trail Partner managing that community's section. The Lakelands Trail is one of four linear state parks in the Michigan State Park System which has been improved through cooperative efforts of local municipalities and the Michigan Department of Natural Resources (MDNR). The 6.5-mile Hamburg Township section of the Trail is a Rail to Trail route that was redeveloped into a 16-foot wide, non-motorized pathway, with a 10-foot wide section paved for walking, bicycling, rollerblading, running, and cross-country skiing, and a 6-foot wide turf lane for equestrians. The improved trail now spans the entire width of Hamburg Township and provides direct intermodal linkages with numerous public and private developments throughout the community including the Hamburg Community Library and Manly Bennett Park. The Lakelands Trail is part of the Great Lakes to Lakes Trail system from South Haven to Port Huron, and plans to connect it to the Iron Belle Trail are being discussed. The construction, which began on September 21, 2015, included improvements to the trail between Hamburg and Hall roads, as well as a fully paved parking area and information kiosk. The project was funded by a grant awarded to the Township by the Michigan Department of Natural Resources. Hamburg Township General Fund monies were used to purchase the property and pay the match for the grant. The project is adjacent to Winkelhaus Park in the Village of Hamburg, which is maintained by the Township through a lease agreement. A ribbon cutting ceremony was held on Tuesday, December 1, 2015 at 1:00 p.m. to celebrate the trails completion.